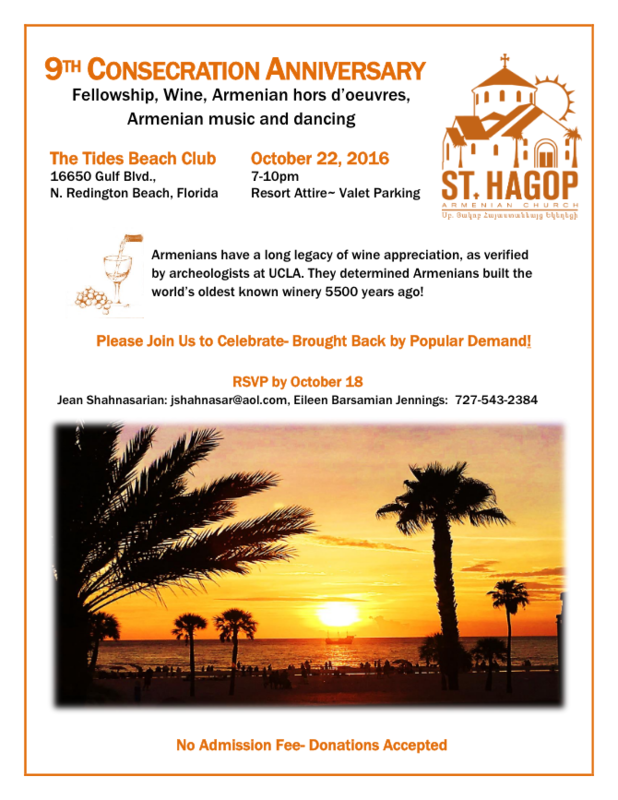 Join Armenian Americans in Tampa, FL to celebrate the 9th Anniversary of St. Hagop’s Consecration on Saturday, October 22, 2016 from 7:00 pm to 10:00 pm at The Tides Beach Club. We will have a selection of wines, cheeses, Armenian hors d’oeuvres, music, dancing and much more! The Tides Beach Club is located at 16650 Gulf Blvd, North Redington Beach, FL. Please RSVP to Jean S. by October 18 at jshahnasar@aol.com or Eileen B. at 727-543-2384. Dress attire is resort and entrance is free with donations encouraged. Posted on October 10, 2016, in Armenian Church, Arts & Culture, Events, Food, General Update and tagged Consecration, St. Hagop Armenian Church, Tampa. Bookmark the permalink. Leave a comment.